This Versace square scarf is an explosion of color and energy. 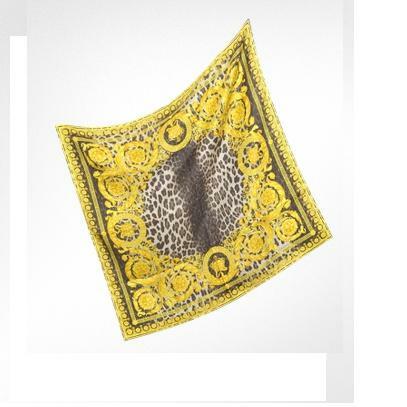 Featuring Versace unique ornamental design combined with Leopard print, this shawl is a bold and glamorous accessory that will lend a terrific look. Made in Italy. The Versace-style has become a trademark of its own. If one seeks to characterize Versace, you can always point to Giorgio Armani. Versace is everything Armani is not. He is known for striking colors, materials, and cuts. His collections for men and women are attractive pieces of art. On first sight his work seems to reflect the typical Italian grandezza. On second sight, Versace seems to draw only from those images (like the neo-classicistic ornaments in his prints), pushing them to the limits, in order to question any prevailing common agreement on “good taste”.